BBQ on the fourth, a photo by Southworth Sailor on Flickr. This past weekend we had the chance to spend some great time with family. On Sunday, the Bulthuis clan, including my siblings and their children converged on a downtown Seattle condo for Brian Bulthuis' fiance Kate's bridal shower. Brian and Kate live in New York, but came out for the weekend. Kate's sister owns a spectacular condo on 2nd Ave. between Pine and Pike. The ladies stayed at the condo on the 38th floor overlooking the city while the men walked down to Safeco Field to watch a Mariner game. After the game we spent a couple of hours back at the condo visiting and enjoying the view. 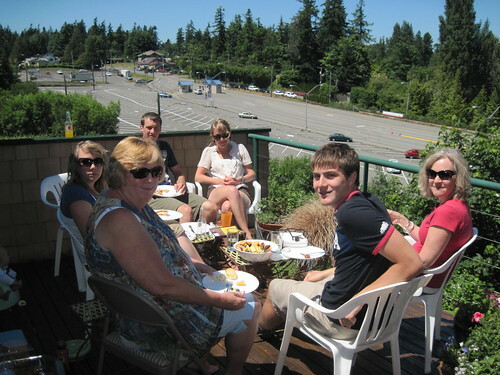 Then on the Fourth, Ellen, Jenny, Ada, Ruby, Markus and Steph joined us in Southworth for a great day. We enjoyed the great weather and went to Harborside Park and watched Ada enjoy the fountains. Ada and Papa took a couple walks to the beach and the 'gummywormer store' All have gone home and it is painting weather in Southworth.